As part of our distribution options, we offer a full consolidation service which serves as a cost efficient solution. 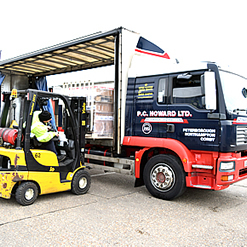 As a complimentary addition to our full load service , we offer a full consolidation service (Groupage), where we build up loads and provide cost effective distribution services for part loads which consist of consignments typically of 3-10 pallets. Taking advantage of our considerable assets including fleet and high tech integrated systems support, we can take small consignments and consolidate them with other goods which will save you considerable expense. With nationwide coverage, our groupage services are geared to provide you the customer with total satisfaction. With any distribution service, speed and reliability is the key. We place heavy emphasis on providing you with the highest levels of customer service possible. All shipments are monitored on a daily basis and the entire process is managed from start to finish.